At the moment I am renting a room in Wezep. It’s a quiet neighbourhood and the shops are just minutes away. Like many people in the Netherlands, the guy I am renting the room from has more than one bike and he has said I can use one of them. Apart from a brief trip to a friend’s allotment, when I was living in Wageningen, I haven’t done much cycling in the Netherlands, so I thought I’d rectify that today. I had no particular destination in mind, so I just hit the road and kept going. Twenty minutes later I realized I’d gone in a circle and was more or less back where I started. 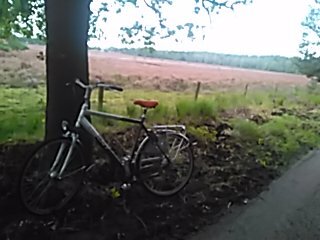 Not to be deterred, I decided to head towards Apeldoorn. Wezep to Apeldoorn is a distance of around 36km, so I was not seriously planning on arriving there, only heading in that direction. The trains in the Netherlands are extremely efficient most of the time, and I really enjoy travelling by Sprinter or Intercity, but if you want to take your time and see some of the countryside cycling is the way to go and, although there may be a few slight inclines and declines here and there, you are unlikely to have to puff and pant your way to the top of a hill. It’s very different to cycling in North Yorkshire. I used to cycle a lot and I have plenty of experience when it comes to big hills. Like Wageningen, Wezep is in Gelderland, and it’s a very scenic region. 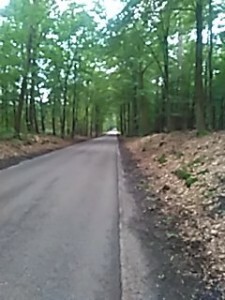 I spent quite some time cycling along roads thare were surronond by woodland, encountered a clearing where that was mostly sand, and then rode through an area that would be called moorland in England. I have no idea how Dutch people refer to it. I rode to Epe and then to Emst. When I saw I sign saying I was leaving Emst and saw open country in front of me, I turned around and headed back. By then I’d been cycling for over 90 minutes. I was feeling hungry and remembered seeing a café that was open in Epe. I had chips on my mind it was as simple as that. A can of Coke, a burger with salad in a bun, and portion of chips and mayo cost less than €8. I think that was pretty good value and the amount of mayo that was provided was so generous I ran out of chips before the dipping section of my tray was empty. All in all the journey took around four hours, but I was not in a hurry, stopped to take pictures and admire the view along the way, and sat outside the cafe for over 30 to 45 minutes. Google Maps estimates the journey should take just over an hour each way, so I guess I was guilty of dawdling. Next Article Next Article: Rebuilding my Website—Again!